Extending POJO based Bean Data Control to add the features you wanted (such as Named Criteria and af:query) ! I blogged about bean data control and pagination support a while back http://www.jobinesh.com/2011/03/what-you-may-need-to-know-about.html. Look like it is time to revisit this stuff to share few more interesting things on extending the features offered. While talking to some developers I realized that POJO based bean data control need few more extra fittings to make it more developer friendly ;) . For example out of the box support for af:query (i.e af:query backed up by named criteria that you may find for JPA based Bean Data Control) is one feature that is still missing. In this post, I'm sharing a sample which uses an enhanced custom DataControlHandler to help you with out of the box query component and pagination support that you may otherwise find missing. The sample that I'm sharing here is built using 12.1.2.0.0. As 12 C has a lot of improvements on bean data control implementation, the custom DataControlHandler used in this sample will not work on previous JDeveloper/ADF versions (as it uses the new APIs from 12C). With this sample, I just wanted to show you that most of the pieces that you may see in the framework are extendable, and you can add the features your own. Try it out if you love fun. Ah yes, you may need to spend some time on understanding their working though. You can download the sample workspace from here. Take a look at the ExtndPOJOModel project to get a feel of the framework extension classes that we are talking in the following section. This sample uses following framework extension classes. These classes are available in ExtndPOJOModel project which is part of the sample work space that I shared above. SimpleBeanDCDataFilterHandler extends DataFilterHandler : This is the custom data control handler class used in this sample in order to enable query and pagination support for a bean data control. This class is hooked to the ADF run time by pointing DataControlHandler entry that you see for bean-definition entry (in DataControls.dcx) to this class. SimpleBeanDataCollection extends BeanDataCollection: The SimpleBeanDCDataFilterHandler uses this class as a data structure to return the collection of Java bean requested by the client. In fact this class does more work than you expect, its the real 'work horse' here which reads collection from your Java service class and issues appropriate queries to it whenever client ask for data. SimpleSearchCriteria : A custom data structure used by the SimpleBeanDataCollection to pass the search conditions to your Java Bean. SimpleCriteriaItem : Search conditions are represented by this class. 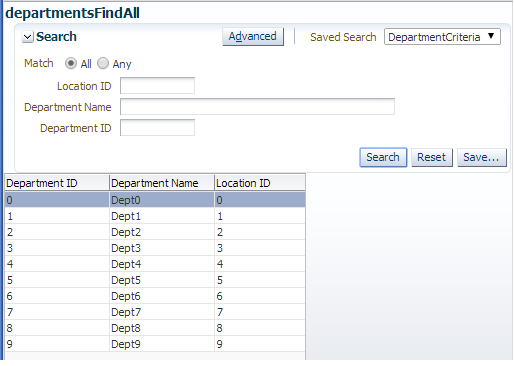 SimpleSearchCriteria holds collection of SimpleCriteriaItem. -Memory or Both. That said, however, in-memory filtering may not be a right choice if you have large number of elements. As I said earliear, these are extensible pieces, feel free to add more features as you need. Is there any manual labor involved to use custom SimpleBeanDCDataFilterHandler ? After creating data control, open DataControls.dcx and update the value for DataControlHandler in bean-definition tag as shown below. This method will have logic to return appropriate collection by reading search conditions and paging parameters passed through SimpleSearchCriteria parameter. Move back to the jsf source, and add af:query component with binding to the the search region binding that we created in last step. You are done. If you run the page, you may get a nice search page powered by af:query on the front end and your own handler on the back end. I created a simple data control that returns a list of POGO objects. The page retrieves the list once and displays the data but I Can't seem to get it to refresh when the backing data changes. Calling Execute on the list binding does nothing. What is the best way to force the datacontrol to refresh? The download link is working. You should try another network before posting here. Well done, every one can have to look at your blog to be good.